Jesse William Lazear was born on May 2, 1866 in Baltimore, Maryland. His early education was obtained at Trinity Hall, a private school in Washington, Pennsylvania and he went to Johns Hopkins University, graduating in 1889. He studied medicine at Columbia University, graduating in 1892. After earning his M.D. he served for two years at Bellvue Hospital in New York City, where he was the first person to ever isolate Neisseria gonorrhoeae the causative bacterium of gonorrhea, in pure culture from a blood sample. After finishing his hospital service he spent a year of study and investigation in Europe, during part of which which he worked at the Pasture Institute in Paris. After his return from Europe he was appointed bacteriologist to the medical staff at Johns Hopkins University and also served as the assistant in clinical microscopy at the university. 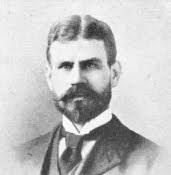 In February 1900 Lazear reported to Camp Columbia, Cuba for duty as acting assistant surgeon with the U.S. Army Corps. stationed on the island. There he undertook the study of the tropical diseases, particularly malaria and yellow fever, affecting American troops on the island. In May of 1900 he was appointed to a board, which was headed Walter Reed, commissioned to study yellow fever in Cuba. Yellow fever is a hemorrhagic viral disease that begins suddenly after an incubation period of three to six days. Symptoms include fever, headache, chills, back ache, loss of appetite, nausea, and vomiting. In about 15% of cases this acute phase if followed by a toxic phase with symptoms of jaundice (due to liver damage), bleeding in the mouth, gastrointestinal tract and eyes. This toxic phase is fatal 20% of the time. There is no treatment for yellow fever, but there is a vaccine. Yellow fever is transmitted by the bite of the yellow fever mosquito (Aedes aegypti) and the tiger mosquito (Aedes albopictus). While he worked at Johns Hopkins, Lazear had followed the research of Sir Ronald Ross concerning the mosquito vector for the transmission of malaria. This experience allowed Lazear to be open to the theories of Cuban scientist Carlos Juan Finlay, who believed that mosquitoes were the vector for the transmission of yellow fever. By June of 1900 Lazear was culturing mosquitoes, from samples he had obtained from Finlay. The board however, acting under the instructions of Army Surgeon General George Miller Sternberg, had been investigating Bacillus icteroides as the causative agent for yellow fever. This line of research quickly proved to be fruitless and Lazear was well prepared to pursue research using mosquitoes as a vector for the disease. The project started on August 1, 1900, using the mosquitoes that Lazear had cultured. Recording his experiments in a small pocket notebook, Lazear recorded the work of raising and infecting mosquitoes, and on August 11th to the 31st recording a series of inoculations, the last two of which produced full blown cases of yellow fever, proving that the vector for the disease was a mosquito. Although there is no direct evidence of him purposely infecting himself, his notebook was given to Walter Reed and was lost at the time of Reed's death, Lazear became infected with yellow fever, which would prove fatal. Lazear died on September 26, 1900. He actually died on the 25th of September in 1900. Fascinating article and I'm glad to be a descendent of his.